Summary: The Loggerhead Marinelife Center will expand its Jr. Marine Biologist Program to include children in grades 2-12, include three additional weeks of programming to total eight weeks, and revise our current program curriculum. This program has proven to be a great way for us to further the goals of the FFWC Marine Turtle Protection Program. 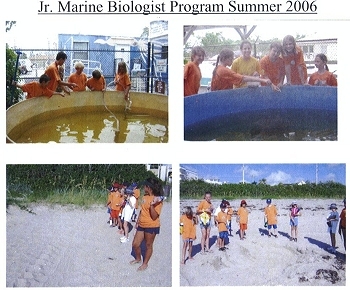 Throughout its nine-year history, the Jr. Marine Biologist Program has engaged approximately 1000 students ages 11-15 in hands-on learning about sea turtle conservation, biology, ecology and rehabilitation. We seek to add programming for younger students, grades 2- 4, in addition to the already served audience of grades 5-9. In addition, we will add a Summer Internship opportunity for students in grades 10-12. Using the materials created with the 2002-2003 Sea Turtle Grant funds as a guide, we seek to create a revised curriculum to include information for students in grade levels 2-9, and a Summer Internship Handbook for the participant interns. The funding requested is for development of the revised student curriculum, the Internship Handbook, and personnel costs involved in staffing the expanded summer program.